The Ordnance Cleaning System can be operated by one serviceman, significantly improving efficiency. 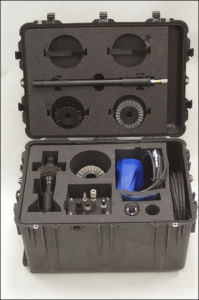 Its compact design allows for all components to be enclosed within a weatherproof case. The vibrating action of the cleaning system quickly removes all residues and fouling, leaving the bore in pristine condition. The cleaning system is first removed from its case, and assembled into the bore cleaning configuration. 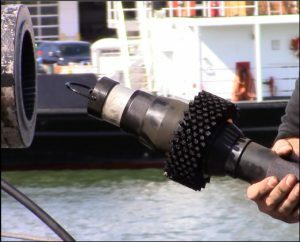 Equipped with a stainless steel bore cleaning brush, the cleaning system is inserted into the muzzle end of the weapon. The air supply is then turned on via the control box. The pneumatic cylinder, which drives the linear oscillation of the cleaning system, travels down, cleaning the entire length of the weapon’s bore. 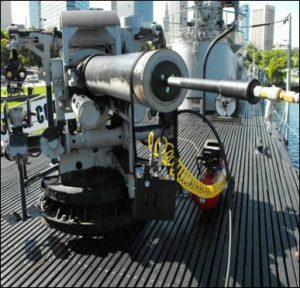 Once the cleaning system reaches the chamber area of the weapon, a small tug on the pneumatic supply line reverses the direction of the brush, and the cleaning system begins moving back to the muzzle. 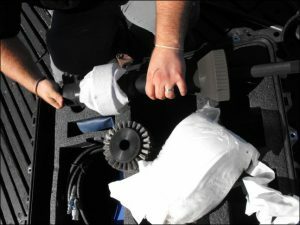 The next step of the bore cleaning process is to equip the cleaning system with an abrasive plastic bore brush, and a tie-on swab. The cleaning system is again inserted into the muzzle, and operates as previously described. Lastly, the cleaning system is equipped with a black nylon bore cleaning brush. The oil dispensing unit is filled, attached to the forward end of the cylinder, and inserted into the muzzle of the weapon. As the cleaning system moves down the length of the bore the oil dispensing unit sprays in a conical pattern, leaving a thin protective coat of oil down the entire length of the bore. The former steps are replicated with the chamber cleaning configuration, to clean the chamber area of the weapon.